4 String Bass? 5 String Bass? 6? ? How about 2? 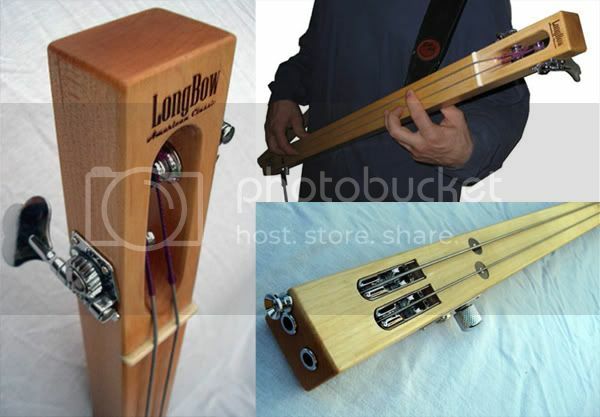 It is the Longbow American Classic 2 String Bass. Pretty straight forward, although quite high quality-looking, construction. More stickish that a Chapman Stick and as fretless as can be. Two strings, machine heads, pickups, volume control and individual bridges – it’s all there, except the extra strings of course! They even do a left handed version at no extra cost. Next up… Something completely different! wow its deffineatly a change on the perspective on bass guitars standard 4 and up string number. Certainly a poke in the eye for the 7 string crowd 😉 – I feel normal with 5 strings now! There really isn’t a whol lot of bass there. So what does that mean as far as tonal qualities? I like a bass that has a great tone and sound without electronics, just as an indicator of overall sound and what can be altered with it. I’ve seen Seasick Steve use a 1-string ‘Diddlybow’ on TV. Is there a Zen guitar/bass with no strings? No Shiz!!! Yeah, it only has two strings, but that has to be the koolest bass i’ve ever seen, it’s more like a stick with some vines wrapped around it but whos gonna take the time to look? I gotta give props, thats just to dang cool. check out the D.A.D. video “Sleeping My Day Away” on you tube and tell me that’s not a wickid looking two string bass!! 4 srtinged bass guitar lacks bass!..